Most acorn squash recipes I’ve tried are sweet and simple, with a basic flavor palette. But I was determined to come up with something a bit more unique, with bold flavors. So with some acorn squash that I just received in my most recent Farm Fresh to You package, I got to work coming up with a tangy and spicy topping for my roasted acorn squash wedges. And I hit the jackpot with a Chile Lime Vinaigrette that I was actually planning on using for my salad. Instead, I drizzled it over the roasted squash, and it was absolutely delicious. The contrast of the sweet, delicate squash with the tangy citrus and spicy chile peppers was perfect. Both my husband and I devoured it. I used cayenne peppers in my vinaigrette because I like things very spicy, but just about any chile would work. If you prefer something more mild, I’d suggest seeded jalapenos, Anaheim peppers, or even red bell peppers. This would make a perfect healthy and unique Christmas side dish recipe! And each serving is just 2 Points each, making it an ideal Weight Watchers Recipe. Enjoy! A unique and spicy twist on a basic roasted acorn squash recipe, these amazingly delicious squash wedges are roasted and then drizzled with a tangy chile lime vinaigrette. I was wondering if you are supposed to add paprika to the vinaigrette and sprinkle it on top, or leave it out of the vinaigrette. I am just confused as it is only listed the one time but seemingly used twice. Such a perfect recipe for this time of year. I’m a spicy girl myself so I enjoy adding cayenne pepper to anything. 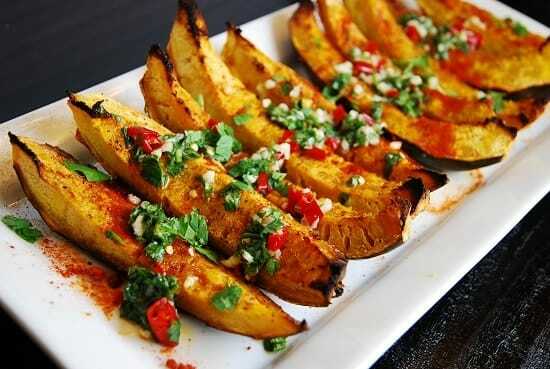 Love this Mexi spin on acorn squash. Dumb person question: Do you eat the skin of the acorn squash? Nah…it’s a little too thick and tough. The squash peels nicely out of the skin when roasted. It can go about 3 days in the fridge. Another reader suggested to try making just the soup part of the casserole, and the freezing it, adding the bread and cheese only to each portion when ready to eat.